Crisp meringue layered with fruit and softly whipped cream is what British summers are made for. Nino has recently discovered ‘I spy’, or a two year old interpretation thereof. The game more than often involves him naming a noun (most likely an animal, food stuff or vehicle) then demanding that I ‘do a [insert cat, ice cream, tractor] mummy’. I’ll name the letter with which it begins, provide a couple of clues then wait for his excited answer. Repeat ad infinitum. This weekend we were baking and I kicked off the round with an ‘M’. Clue: ‘it’s crispy on the outside, chewy in the middle and made from eggs. Nino helped mummy whisk it up and we’re going to fill it with whipped cream and blackberries.’ To which he replied, after serious consideration . . . ‘it’s a yummy pavlova’. Well, you can’t win them all. 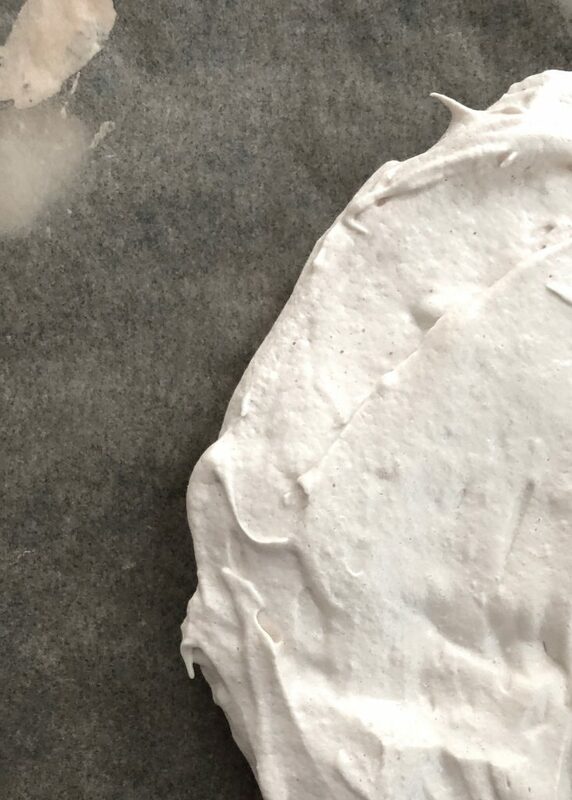 Pavlova vs meringue aside (I’m pretty sure this is meringue because there are layers, correct me if I’m wrong), this simple bake is the perfect summer pud. The meringue shells can be made in advance at a low temperature (no sweltering oven on the hottest days) and assembled in situ if you’re travelling to friends or family. Strawberries and cream is classic for an Eton mess feel, I’ve used lemon curd and blackberries here but any comhination of fruit, with perhaps some citrus and a sprinkle of nuts for crunch, will work. Whipped cream is slathered between each layer, the fruit piled on and when sliced into wedges you get that glorious experience of smooth, crisp, sweet and tart all at once. In other news, we’re moving house! After what feels like months of negotiation we’ve finally exchanged and I cannot wait to see what this change of scene will bring. New baby, new house . . . this season of our lives is a busy, exciting time, enough to fill many blog posts to come. For now, suffice to say I’m looking forward to getting to grips with our new oven, working out its eccentricities, if any, and getting my meringue game on track. It’s my Dad’s birthday in a couple of weeks and I’m going to be road testing it for the perfect birthday cake. Recipe coming soon, but for now, meringue. Or pavlova. A rose by any other name . 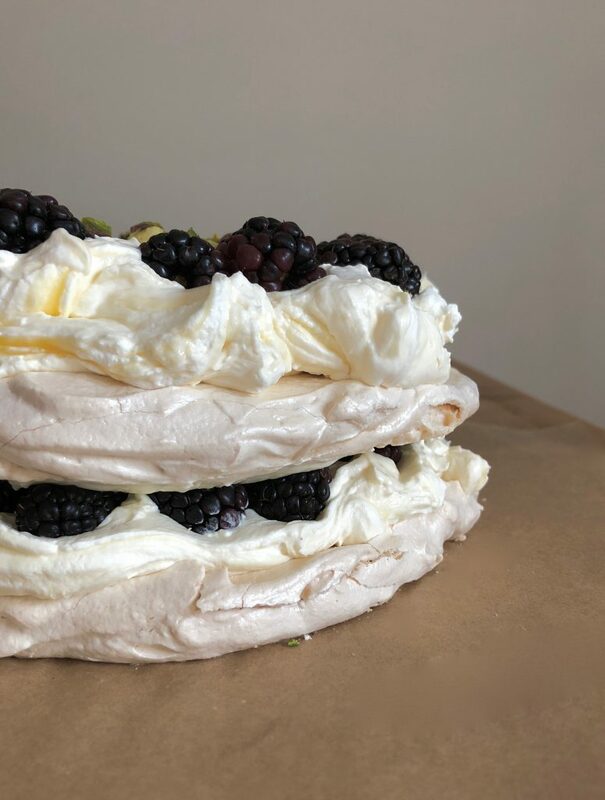 . .
Layers of crisp meringue with marshmallowy middle, softly whipped cream, tart lemon curd, blackberries and toasted pistachios. This layered meringue makes a wonderful centrepiece for Sunday lunch and looks a lot more impressive than the minimal effort it involves to make. Preheat the oven to 180 C/160 C fan. Line two large baking trays with baking parchment. In a large bowl, whisk the egg whites until soft peaks form. Adding the sugar 1 tbsp at a time, continuing to whisk until you have a stiff, glossy meringue. Divide into three, placing two big dollops nto one baking sheet and one on the other. Spread out until you have three circles approx 20cm in diameter. Place the trays in the oven and immediately reduce the heat to 140 C/120 C fan. 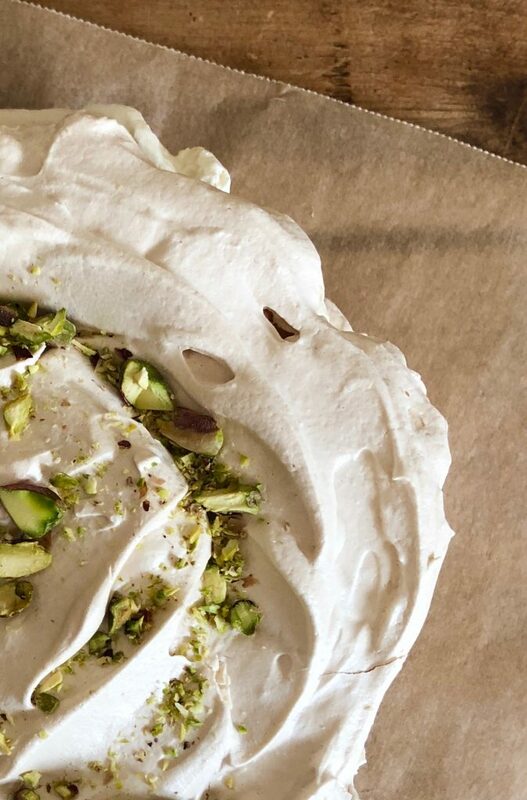 Bake for one hour then turn off the oven and leave the meringues inside to cool completely. 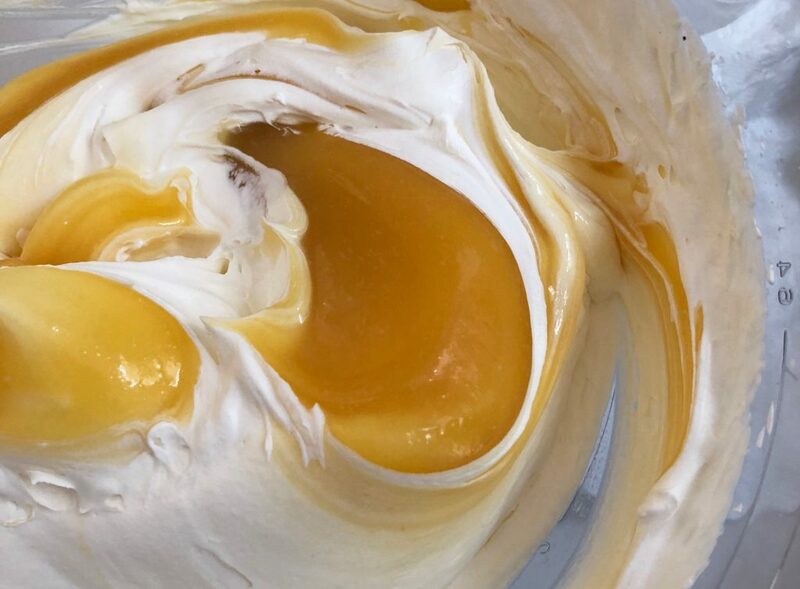 When ready to serve, whip the cream until soft peaks form and fold in the lemon curd. 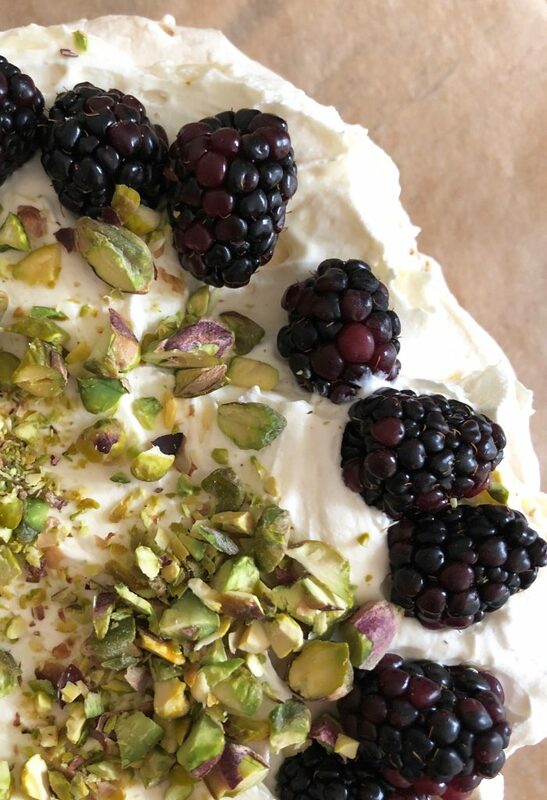 Remove the meringues from the baking parchment and layer with whipped cream, blackberries and a sprinkle of pistachios. Serve in thick slices. This meringue cake is best eaten on the day of making, but leftovers will keep in an airtight container in the fridge for a day or two.